Gloria hails from Portadown, Northern Ireland and started her professional life as a singer making many records. After a spell working in Canada, her media career started as a BBC production assistant in Belfast and as a local radio broadcaster. Gloria’s popularity soared in Northern Ireland and during the 1970s and 1980s she presented Good Evening Ulster and, on network ITV, Sunday Sunday and We Love TV. Gloria progressed within the BBC and became the first woman to present her own daily radio show on Radio 2 which continued until 1995. 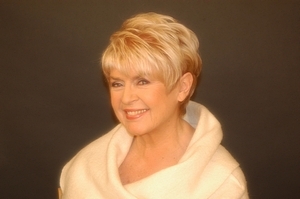 During the past 20 years, Gloria’s career as television presenter and celebrity has blossomed and has seen her appear in numerous programmes including Gloria Live, Wogan, Holiday, Songs of Praise, Kilroy and Open House with Gloria Hunniford. Gloria has won many awards including TV Personality of the Year and Best Dressed Female and has made a health and exercise video called Fit for Life. In recent years, Gloria appeared on BBC’s Strictly Come Dancing, dancing with Darren Bennett and was one of the presenters of Heaven and Earth until 2007. Still as busy as ever, Gloria is currently filming Cash in the Attic for BBC1 and Castle in the Country with John Craven for BBC2. She also has a weekly debating slot on The Alan Titchmarsh Show and is part of a formidable female trio with Angela Rippon and Jennie Bond presenting Rip Off Britain, a consumer complaints programme on BBC1. Gloria was hosting The Variety Club International’s Awards Banquet at London’s Guildhall in 2009, at which the choir was invited to sing three songs for the 500 guests present - including Prince and Princess Michael of Kent - when she first heard the Orpheus. From the moment she heard the choir sing, and following rapturous applause, Gloria became ‘hooked’ on the Orpheus sound and accepted an invitation to become co-patron of the Orpheus alongside her friend and fellow co-patron, John Ratcliff, CBE. Both are regular guests at the Orpheus' annual concerts at the Wycombe Swan theatre every May. The choir is delighted to be associated with Gloria who has deservedly earned iconic status in the hearts and minds of the British public. Over a period of more than 40 years, John has built a very successful group of engineering companies, amongst which is the UK No. 1 in designing, manufacturing and marketing a complete range of tail-lifts for a whole range of vehicles. Wessex Lifts who design, manufacture and sell low rise lifts for disabled people both in the home and public places are also part of the Ratcliff Group. Stone Hardy, a national maintenance & repairer of commercial vehicle tail-lifts and bodywork, from eight locations, complete the group. John has given a major part of his life to charitable works for over 40 years. In 1985, he was the Chief Barker of the Variety Club of Great Britain. In 1993, he served as International President of Variety International for two years, visiting over 50 clubs in 14 countries. All this was done with the support of his wife Marsha Rae, the inspiration for the largest fundraisers for Variety around the world including the famous “Gold Heart” Day. John is very proud to be a Companion of the Grand Order of Water Rats, having been appointed in 1993. In the City, John became the Master of the Worshipful Company of Carmen in 1997. 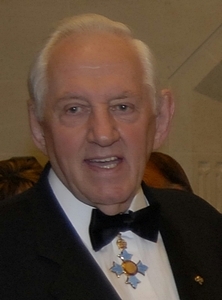 For six years, he has been Patron of the SOE (Society of Operations Engineers). In the 2000 New Years' Honours List, he received a CBE for his service to the Transport Industry and also his work with disabled young people. He was thrilled to be invited to become our patron in 2009 and has since been joined by his very good friend Gloria Hunniford. The choir is delighted to be associated with John and we thank him sincerely for his contribution in promoting the Orpheus in his charity work within the entertainment sector.